What does it cost to rent a traveling exhibition? The costs to rent a traveling exhibit vary widely depending on the size, complexity, subject matter, and underlying objectives of exhibition owners. The X-axis is the size of the traveling exhibit, in square feet. Note that while prices vary widely, if we look at the subject areas, only science/technology exhibitions and one natural history exhibition reach prices of ~$200k and above. Anthropology maxxes out at $100k, and children’s exhibits top out around $75k. 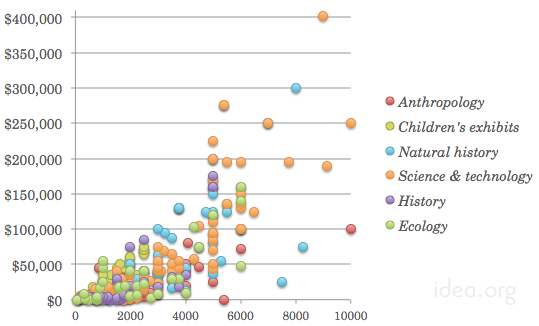 The above graph represents N=332 records from the TED database from Informal Learning Experiences (ILE). Some prices are for 1 month, and some for 3-4 month terms; most 1-month rentals have a lower per-month cost for additional months. These are traveling exhibits that require open space (as opposed to flat wall space), and excludes exhibitions that do not publicize their asking prices. Also, according to Mac West, principal of ILE, the TED data does not include the blockbusters — i.e., large exhibitions from major museum consortia or large scale commercial vendors, like the Harry Potter exhibit discussed earlier in the week. “Another cost is shipping, gallery preparation, staffing, marketing/promotion of exhibition, public programs,” says Michelle Torres-Carmona of the Smithsonian Institution Traveling Exhibition Service. According to Wendy Hancock, the Exhibition Services Manager for ASTC, the ballpark storage costs are $1000/month for storage per truck. A 5000 sq ft show may occupy 3 trucks. The contents are unloaded into a warehouse. Sometimes shipping costs for a show that is zigzagging the country are shared across all the hosts.